Specially developed versions of the Michelin Pilot Sport Cup 2 tires will be the sole original equipment fitment on the new limited special model BMW M4 GTS. As a track car that is approved for road use, the job of Michelin’s engineers was to design an ultra-high-performance tire which is able to operate safely in a variety of road and track conditions around the world. 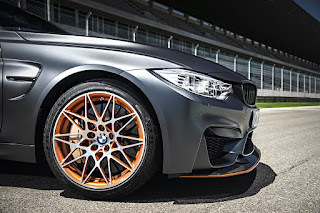 To this end, the Michelin Pilot Sport Cup 2 tires for the BMW M4 GTS were produced using not only Bi-Compound asymmetric tread patterns but also an asymmetric casing design. This offers the optimum balance between handling, grip and tire life. During the development process Michelin produced and tested more than 1,000 prototype tires and 400 special series tires which were tested by both Michelin and BMW M test drivers. To achieve all of the performance characteristics demanded by BMW M, Michelin’s engineers focused on the interaction between the tire’s tread compounds, architecture and profile, and between the tires on each axle. This ensured not only good road manners in terms of steering effort and response, balance and comfort but also fast lap times and consistent performance on track – with a particular objective to limit heat build-up and wear. In addition to Michelin’s Bi-Compound technology, the Michelin Pilot Sport Cup 2 tires also incorporate the motorsport-developed Track Variable Contact Patch 3.0. This optimises pressure in the tire's contact patch so the same amount of rubber is always in contact with the road or track, whether driving in a straight line or cornering. As well as the bespoke technical elements used inside the tyre, the Michelin Pilot Sport Cup 2 tires also use Premium Touch Technology in the design of the sidewalls. This means that as well as offering very high levels of performance, the tires also look good – an important consideration when fitted to a car as stylish and focused as the new BMW M4 GTS. The tire sizes are as follows: 265/35 ZR 19 Front and 285/30 ZR 20 Rear.